THE chair of an inquiry into child fluids death today spoke of a “rampant” culture of litigation defensiveness in healthcare here. 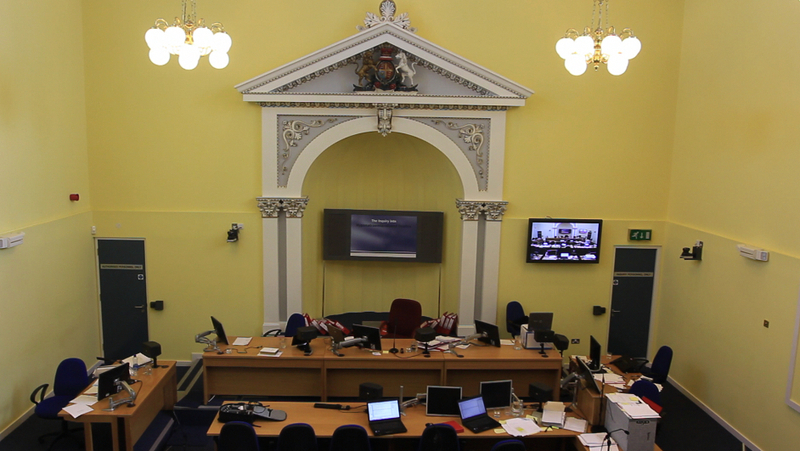 The phenomenon was discussed as the O’Hara hearings in Banbridge heard how a meeting of staff, which formed a key part of the critical incident review into the death of Raychel Ferguson, was not minuted because of fears that the notes could later be used in a legal action which might ensue. New questions also emerged over what knowledge existed in medical circles about the death of Lucy Crawford, who died the year before Raychel but whose true cause of death – fluid overload, like Raychel – had not been given to either her parents or the coroner. Dr Raymond Fulton, who was medical director of Altnagelvin Trust – now part of the Western Trust – when nine year-old Raychel died after treatment there in 2001, denied being told about Lucy a week after Raychel died. The inquiry has already heard that Dr James Kelly, Medical Director of what was then the Erne Hospital in Enniskillen, has said he spoke to Dr Fulton on June 18 at a meeting of medical directors in Belfast. Dr Kelly has said he told Dr Fulton about a child death at the Erne during a conversation about Raychel and that other doctors in the room also spoke of near-misses linked to fluid – in particular the dextrose fluid known as Solution 18. Dr Fulton: I remember the room distinctly, it was a small claustrophobic room with no windows and very hot … I recognised Dr Kelly because he’s from the Erne, fairly near. I started talking to him, holding a cup of tea, I remember very well, and I told him the story of Raychel. I said, ‘We’ve got concerns about Solution No. 18’. And he said, ‘Oh, that’s interesting’, or words to that effect, ‘We’ve had fluid balance problems in the Erne possibly due to the same solution’. Another doctor, based in Daisy Hill in Newry had said he had heard of a similar case in Newry which he would look into and Dr Fulton said he would raise the issue at the meeting. Dr Fulton: had gone at this stage. He didn’t name the child in the Erne, he didn’t say it was a death. I understood it as a problem of fluid balance, in which Solution No. 18 may have been implicated. So I thought it was not really comparable to Raychel’s death. The inquiry is currently focusing on governance issues arising from Raychel’s death: how it was handled corporately and, particularly, who knew what, at what stage and what they did about it. Yesterday (Tuesday) Dr Geoff Nesbitt, who played a central role in the aftermath of Raychel’s collapse and her death, denied any knowledge of Lucy’s death despite his having sat on a working group looking into fluid management which included a number of other doctors who did know about it. Dr Fulton, who was the most senior doctor and one of the most senior managers at Altnagelvin at the time of Raychel’s death, was also shown documents which referred to fluid deaths but said he did not know anything about them; he maintained that his focus had been on Raychel’s case and that the subsequent work on fluid management was not about focusing on deaths. He also said he was unaware of the commissioning by the trust of expert reports on Raychel’s death from Dr Declan Warde in Dublin and Dr John Jenkins in Antrim. He was also challenged about the critical incident review which he chaired the Tuesday after Raychel’s death, when members of staff were brought together to discuss the case. A number of consultants were present but a number of the junior doctors were absent – the inquiry has already heard that Raychel’s first contact with a consultant was after her collapse, at which point her condition was irretrievable. Dr Fulton: there were people in that room, their consultants who would speak on their behalf … and describe their involvement in Raychel’s treatment. Mr Stewart: But Mr Gilliland [consultant surgeon] couldn’t tell you what Mr Zafar [a senior house officer] said or thought, let alone what other doctors who aren’t noted here… The question is, why didn’t you send out for these individuals who weren’t there and ask them to come and give their account, be interviewed or make a statement? Dr Fulton: Because I felt we had enough initial experience of the treatment at that meeting to make a start. Mr Stewart also questioned Dr Fulton on “the almost total lack of documentation” surrounding the review, with Dr Fulton saying that he had carried the information from it in his head. He was also asked to explain why the trust’s protocols for dealing with a critical incident, drawn up the year before with a team including Dr Fulton, carried a warning that statements taken from staff for the investigation could later be discoverable in the event of litigation. Mr Justice O’Hara: The reason it’s being raised, doctor, is this: that this wouldn’t be the first time in the inquiry that we’ve been informed that certain procedures had been followed because there’s advice from medical insurance companies that statements are not taken or that certain steps are not taken. And the specific reference here to future litigation suggests that this may have been playing on your minds when the protocol was finalised. Michael Stitt QC, for the trust, pointed out that the trust’s protocols had been drawn from the work of an authority on health service governance, Dr Miriam Lugon, which carried the same warning and did not reflect a particular culture of litigation defensiveness at Altnagelvin. Mr Justice O’Hara: But surely the point, Mr Stitt, is that the fact that Dr Lugon’s writing along these lines emphasises the culture of litigation defensiveness. Because if you’re writing a book, which is effectively a governance book, and you as the author of that book are dealing with potential for litigation, and in effect what this is saying is: ‘look, if you didn’t have this review system and the claims manager took a statement from a member of staff, that would be privileged’; now, if you’re going to take a statement in the context of a critical incident review within the hospital, there will be a debate about what the dominant purpose of the statement is, whether it’s for litigation purposes or whether it’s for review purposes – and what Dr Lugon appears to be saying here is: ‘the notion of privilege may be challenged, and in the event the information gathered will have to be disclosed’; so what Dr Lugon is emphasising is the risk of litigation and, in the context of the risk of litigation, there is the potential for critical incident review statements to be discoverable. And that being the case, you may consider whether to conduct your critical incident review on the basis that you don’t necessarily take statements because they may become known, in this case to the Ferguson family. Your point is that it isn’t just Altnagelvin which is defensive, I’ll take that point, but what this is identifying is the rampant culture in the Health Service. The inquiry resumes again next week.